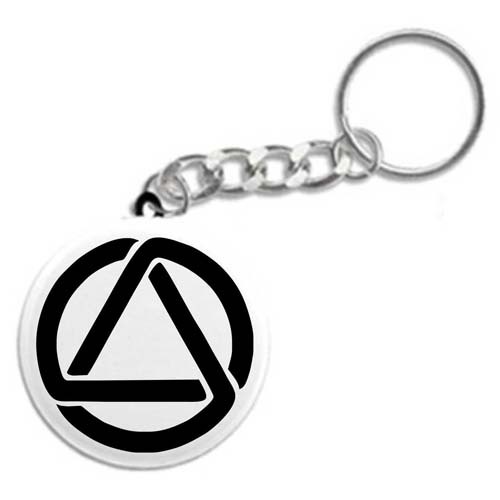 AA Circle and Triangle Key Tag - Recovery Keychains, Key Fobs, and fun 12 Step Gifts! Button Size 1.5 Inch Diam. 2.25 Inch Diam. An awesome recovery key tag for anyone in the program! Excellent for newcomers and old timers alike! Our button-style recovery keychains are not imported or mass produced. Each keychain is carefully and lovingly created by hand, one-at-a-time, by your friends at WoodenUrecover! All keychains are individually created and quality checked. Graphics, text, and photos are color printed on only the highest quality substrate. The .003" mylar covering makes each recovery keychain UV and water resistant. Our methods ensure that your keychain will remain vivid in appearance and last for years and years! Do you have a great idea for a new recovery keychain or button? Looking for a special keychain with your design, art, photo, etc.? Have a special event coming up? Please let us know! We'd love to help create a special keychain or button just for you!